I had the opportunity to attend an affordable and accessible housing event at the Gatineau City Hall the morning of May 4th: “Bâtir notre avenir: tendance et enjeu du logement abordable dans le Région de Gatineau et Ottawa”. The event was organized and hosted by CMHC in partnership with the Ville de Gatineau, and sought to bring together like-minded professionals from both sides of the river to share trends and ideas around affordable and accessible housing in the spirit of collaboration. For a region that is as inter-provincially integrated as the National Capital Region, it is not often that there is an opportunity to gather together to specifically discuss housing issues and share experiences, making this particular event all the more exciting. 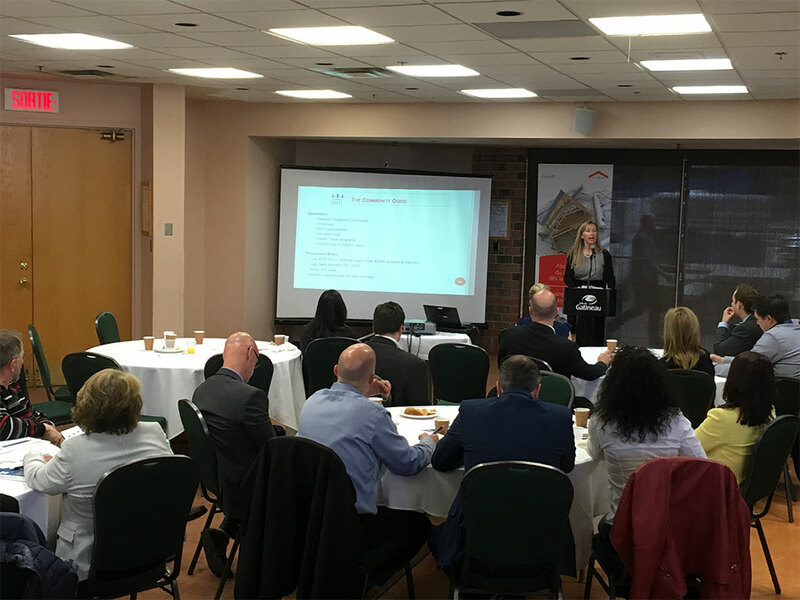 The morning was packed with informative presentations, including: speakers from by CMHC providing an overview of housing trends in Gatineau and contrasting with trends in the Ottawa market; representatives from the Ville de Gatineau and the City of Ottawa on their respective municipal housing strategies and policy/regulatory mechanisms; and wrapping up with two guest speakers to present case studies of affordable housing on each side of the river (affordable housing at Windmill’s “Zibi” project in Gatineau and Multifaith Housing Initiative’s “The Haven” project in Ottawa). Suzanne Le, Executive Director of Multifaith Housing Initiative (MHI), discusses their new affordable housing development, “The Haven”. This inter-provincial session highlighted that the Ottawa-Gatineau Region is made up of two distinct housing markets on either side of the river. Despite the differences in the housing markets on both sides of the river, there is a clear need for affordable housing across the Region. It was also interesting to learn about the similarities in approaches and strategies within the Region. For instance, new affordable housing development in both Gatineau and Ottawa shows leadership in sustainable design (the affordable housing project at 183 Rue Saint Rédempteur was the first LEED certified project in downtown Gatineau – Hull sector). The approach of integrating affordable housing in a mixed-use community or building is also an applied strategy across the Region (a condominium project in Gatineau’s Aylmer sector includes affordable units for rent, made possible by the local community association). Although distinct in certain ways, it is clear that both Ottawa and Gatineau play a role in ensuring the provision of affordable housing to meet the need throughout the National Capital Region. We are looking forward to more inter-provincial events in the Region to continue sharing experiences, practices and success-stories, and promoting collaboration with our partners across the river. The prospect of increased collaboration within the Region is timely, given that the development of a National Housing Strategy is underway.